Few things smell and taste as delicious as a succulent steak, grilled to perfection over an open fire. Unless you're in Panama. Panamanian steak has a well-deserved reputation of being tough, mostly because of what they graze on. 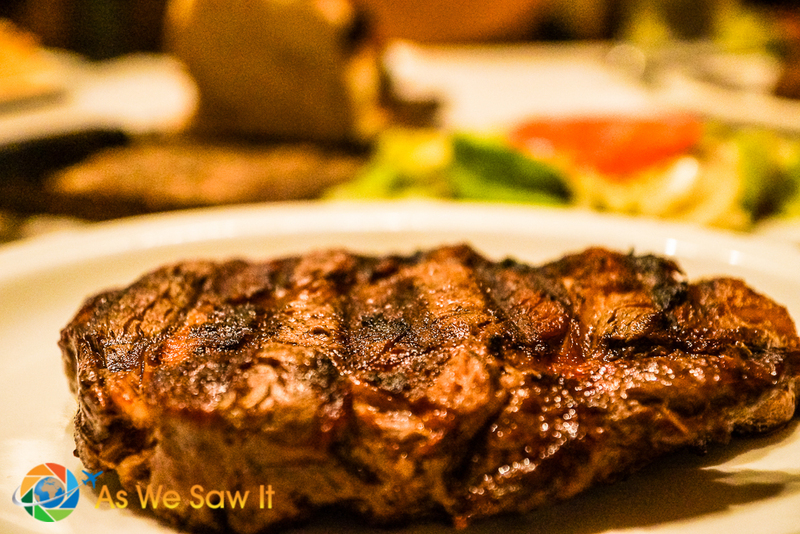 So, steak lovers that we are, we set off on a mission to find the best steak in Panama. After trying a few places and bemoaning the lack of a really good steak restaurant, a friend suggested we try a place that grills steaks Argentinean style. The advantage to being a gringo in Panama is that no matter where we go, we are usually among the first diners to arrive and are rarely turned away for not having a reservation. 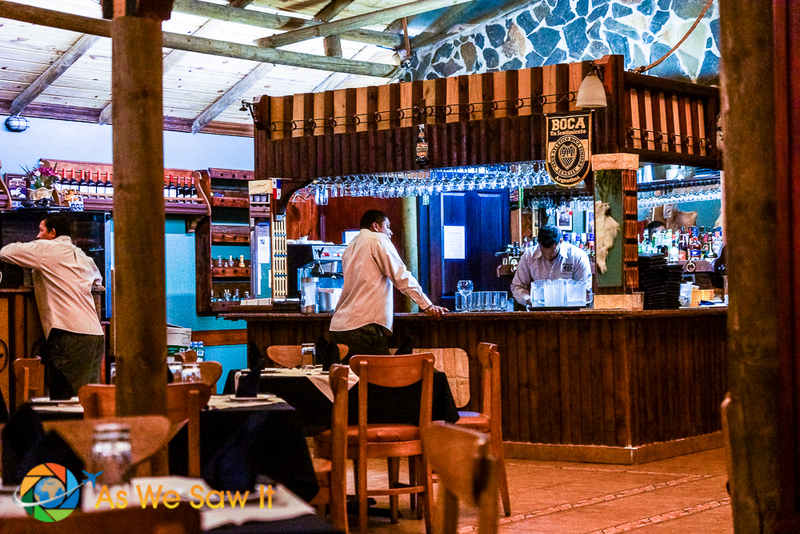 We always get our choice of tables at Patagonia because Panamanians like to dine late. The restaurant fills quickly while we're there and most of the tables are occupied by the time we leave. 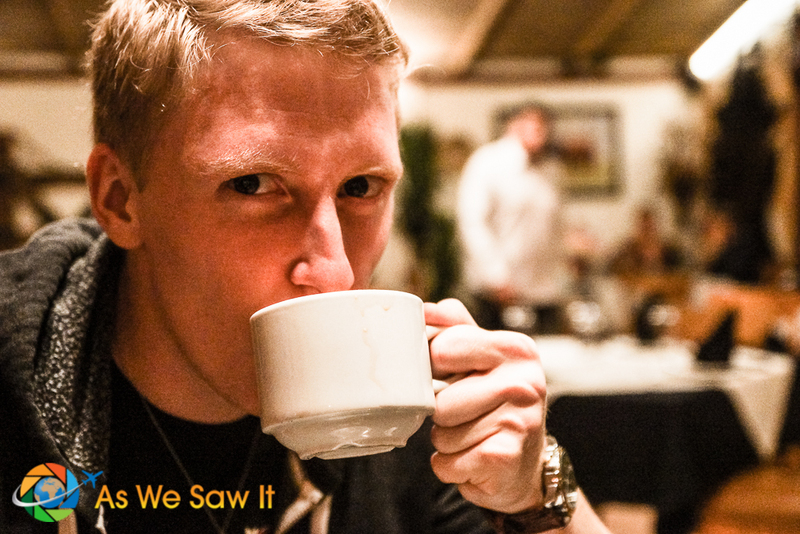 We took our photos at Patagonia Grill before all those Panamanian diners arrived. We’ve been to Patagonia both for romantic dinners and for evenings with family and friends. Even though the room is large, it still feels like intimate dining because the tables are spaced far apart. When we go by ourselves, we like to sit by the window where it is quiet, savoring a glass wine and a perfect steak. 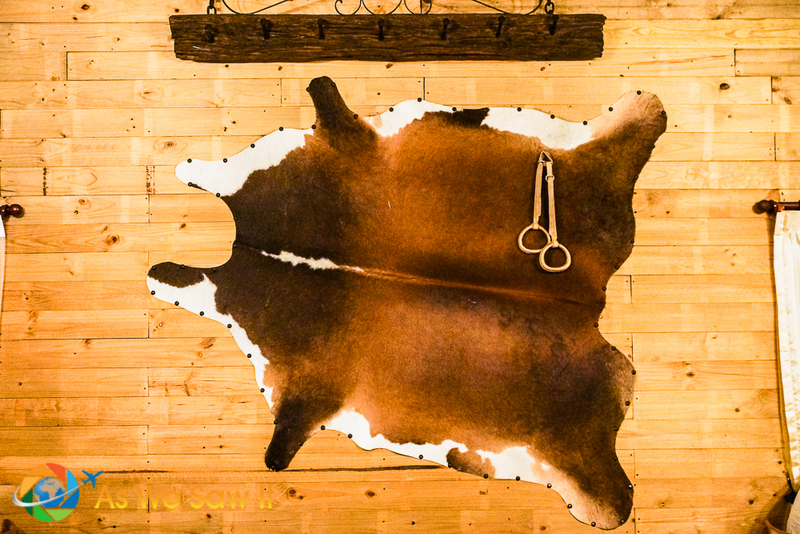 There is a bit of Argentine estancia in Patagonia's decor, down to the cow hide on the wall. It feels like a steak place. That said, atmosphere never keeps a restaurant's tables full. Ultimately, it's always about the food. Despite that the prices are not cheap by local standards Patagonia Grill quickly became one of our all-time favorite restaurants. The quality of the food and the attentive service keep us coming back. Patagonia Grill is not just a name, though. 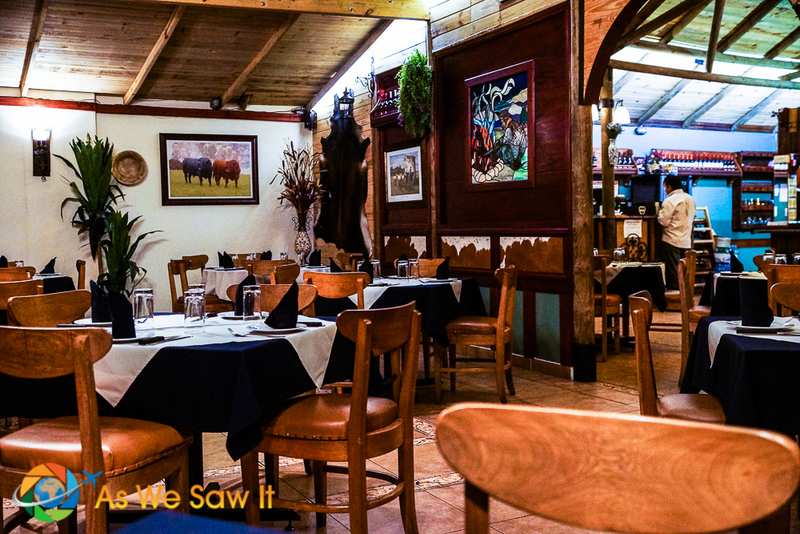 Their wood-fired grill was actually imported from Argentina and the chefs were trained to grill their meats there as well. Judging from the restaurant's popularity and flavor of the steaks, it was well worth the expense. However, the best steak in Panama is not from Argentina. It's USDA American beef. The dining area has the rustic feel of an Argentinean cattle estancia. Service is so prompt that it almost seems as if they have a waiter for each table. They don't of course, but the staff work hard to ensure diners have a good dining experience. They even have a parking lot attendant/security guard to help with parking so guests don’t have to get up to move their cars. Not sure what to order? The waiters are very knowledgeable about all the items on the menu. 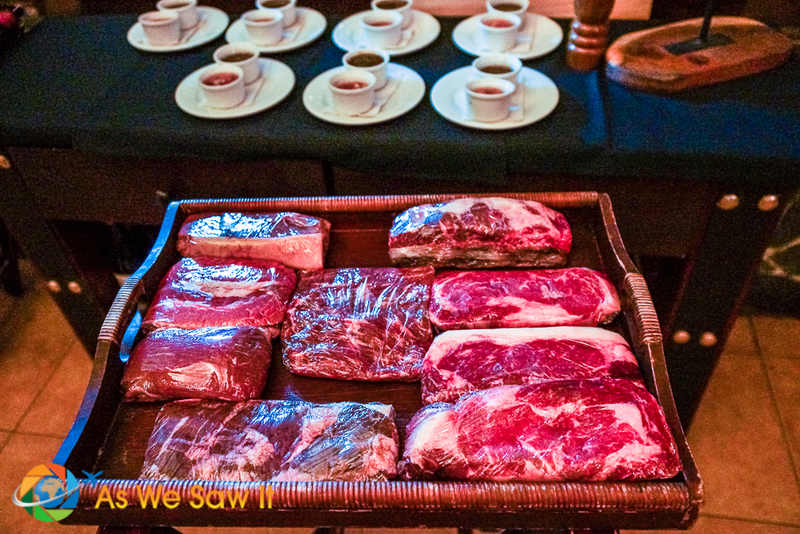 When we come with guests, we ask our waiter to bring the steak tray so they can better understand the menu. He’ll make a clear and detailed explanation about each cut of meat then, based on how they prefer their steak, suggest which cuts would be best. Usually it’s in Spanish but they’re not too bad with English. Patagonia's wine list offers a nice selection of Argentinean, Chilean and Spanish varieties. We usually order a glass of sangria or the (Argentinean) house wine. We recommend the platter of grilled vegetables, Ensalada Campestre, as an appetizer. The roasted red peppers, grilled onions, tomatoes, and mushrooms, lightly charred and sweet from the grilling, practically melt in your mouth. Soon the waiter approaches, bearing a cutting board with a round loaf of hot, fragrant homemade peasant bread and a pot of butter. It’s hard to turn down bread that is so fragrant with the tang of smoke in the crust and char from the wood fire. This is an Argentinean grill; they can raise it and lower it for just the right amount of heat. Result: Best steak in Panama. Dan and I both have our favorite cuts (beef short ribs and ribeye, respectively), though there’s more than steak on Patagonia's menu, and in all price ranges. They even serve planked salmon. We’ve had everything from the 32-ounce Super Patagonia Ribeye to the succulent lamb chops to local filet medallions with asparagus sauce and have never been disappointed. It’s always tender, juicy and delicious. Various sauces are available to accompany your steak (mushroom, mustard, pepper, etc), but to be honest, we think they are unnecessary. They are so good in their natural state or with the Argentine chimichurri or tomato-and-onion salsa that's always on the table. 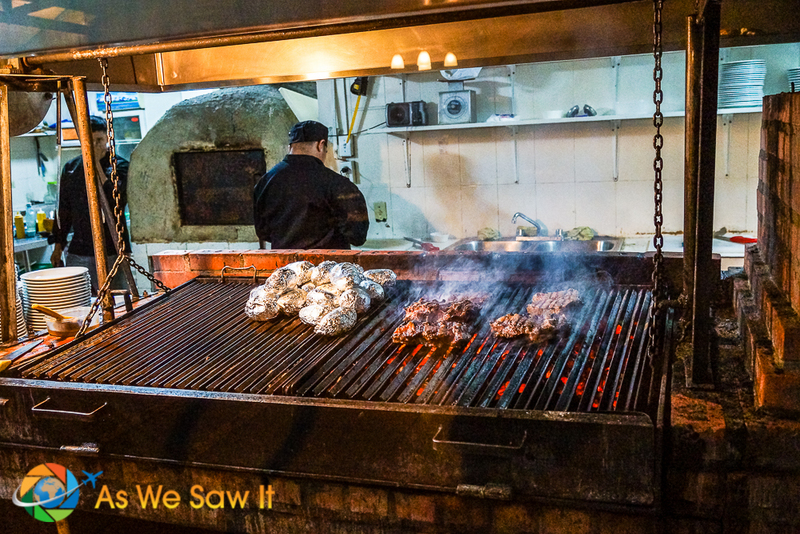 In our opinion, this place serves the best wood-fired grilled meats in all of Panama. Dessert? Yes, please. A cup of cappuccino or cafe con leche is the perfect end to a meal this good. Occasionally we’ll succumb to a little extra decadence though, such as a slice of their key lime pie, delicious flan or their cold dulce de tres chocolates. Patagonia Grill is located in Panama City’s San Francisco neighborhood, just a few short blocks from Atlapa Convention Center. Despite our experience, reservations are recommended. Hours: Mon-Sat 12:00-15:00 and 18:00-20:00 / Sun 12:00-16:30 and 18:00-21:00. By car: Drive down to the end of Calle 50 and turn right onto Via Cincuentenario. Patagonia Grill is one block down on your right, just past the McDonald’s. By taxi: Because Panama City’s streets aren't always clearly marked, it's best to use landmarks when giving directions. Ask your taxi driver to take you to the McDonald’s on Via Cincuentenario, which is near Jimmy’s Parillada. You’ll see Patagonia Grill on the side street's other corner. If you are an outdoor grill master, Amazon sells a similar grill. Wow, this place looks awesome! Very authentic and laid back setting. Glad you enjoyed it! There’s nothing quite like a really good steak, is there? Wow – I used to say I didn’t like steak really. But then I had a good steak. WORLD of difference! And yeah…those look pretty tasty! I think we would get on well with the Panamanians…we don’t seem to make it to a restaurant before 8, even in America! Lucky you! We would like to wait to eat until later too, but our appetites don’t seem to want to wait. Oh my goodness! That steak looks incredible! It made me crave for one right now. What time do you go for dinner and what time Panamanians go? We usually arrived around 6:30-7:00 p.m., which is typical of Americans. The Panamanians began to trickle into the restaurant around 8. What about you? Aaaaah, now I want steak! Beautiful and mouth-watering pictures! Ha, Liz, I’ll confess my mouth started watering just from the memories while I was writing the article. There’s nothing quite like a steak cooked on an Argentinean grill.